13th century, Gospel of Mark. First and foremost, I agree with most scholars (and when I say most scholars, I mean those at secular universities and mainline Protestant seminaries, who have in general followed the tenants of Higher Criticism since the late 19th century) that the Bible is a library, not a book. In fact, many have noted how the word “Bible” itself has evolved from a plural one (the Greek biblia, a neuter plural meaning “scrolls”), to a feminine singular in the Romance languages. This may seem like an excessively simplistic place to start, but for most of the conservative flank of Protestantism, there is a belief in the Bible as a monolithic, internally consistent narrative from Genesis to Revelation, which posits as its sole authorship God, rather than a collection of writings by human authors (perhaps guided sometimes by God) and the sources they use. I reject this outright. Even if a deity chose to reveal all manner of inerrant truth to humans in the imperfect medium that is human language, it would seem highly inconvenient to do so 2,000 year ago, knowing, as such a communicative, omniscient deity must have known, the advancements in knowledge that were to come two millenia later (and beyond). Apart from that theological problem, there’s the problem of manuscript transmission, which is imprecise and messy at best, so much so that conservative churches now often posit a belief of inerrancy “in the original manuscripts,” which of course we do not have and most probably never will. Again, it seems like God could have handled that a bit better. But even aside from those two issues, we have of course a number of places in the received text of the Bible that are just plain inconsistent and contradictory, such that we have two distinct creation stories in Genesis, two different times for the crucifixion and the cleansing of the Temple, different contexts for stories like the calming of the waters, and seemingly different theologies in the letters attributed to Paul, so much so that only seven of the thirteen of them are considered indisputably Pauline. You can pick up any number of apologetic Bibles to explain these things away (Jesus cleansed the Temple twice! 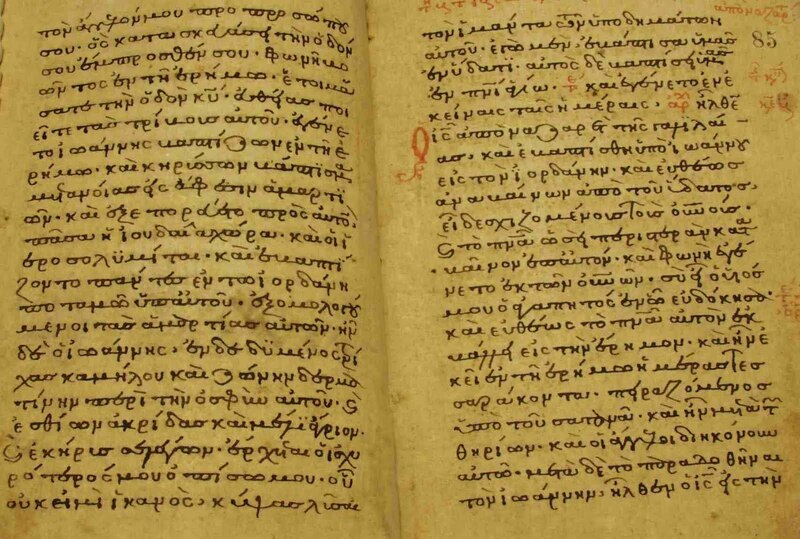 ), but they’re there, and to subscribe to said explanations, you have to start with the assumption that the Bible is internally consistent, a starting point we would take with no other collection of writings from antiquity, even when supposedly written by the same author (no one, for example, bends over backward anymore trying to make sure everything Plato wrote is consistent). So what do we do with it, then? Throw the whole thing out? We could. I find it much more interesting to puzzle over it, however, in the same way I puzzle over other ancient texts in my profession. These stories, even when they are inconsistent, puzzling, or downright opaque, are fascinating, and they have provided us with an enormous cultural framework within which great minds have wrestled with the ever-constant concerns of the human condition, from St. Augustine to Nikos Kazantzakis. Even the devoted atheist will often bring up Biblical stories, even if treated as myths, and use them to argue against the dubious moral claims of those who declare them to be truths, and this proves far more effective than screaming scientific facts at the Bible-believer: “Homosexuality is a sin because the genders are binary and complementary? Why did Jesus say some make themselves eunuchs for the Kingdom of God? Why did Paul say there is no male and female?” Or “Jesus was a capitalist? Right, that’s why he spent so much time teaching his followers about how to make the most money.” It smacks of polemic, but what it’s really doing is engaging in the stories from the inside – using them as a mythological and ethical framework by which we can argue over the issues facing our time. Because let’s face it: this is more effective and quite frankly more interesting than cold, calculating, rational argument alone, as partial as I might be to that in certain situations. In this same way we treat all of the influential classics of literature: they often present timeless truths about the experience of being human, all the more so when they are set in a time and culture that is foreign to our own. By searching them and grappling with them, we can have a better understanding of those things that can cut across time, and also those ways in which our own time and our own culture have uniquely defined themselves. Of course, the first rule in reading the Bible, in my opinion, is to always be aware of the historical and literary context in which a given passage was written. This seems so basic and yet its flagrant violation sets the stage for the worst abuses of Scripture, in which people go hunting in the Bible to find isolated verses that support their own ideologies. And since those who are often most guilty of this are those who are defending a traditional, ideological paradigm, they often can, in fact, find ammunition in the Bible, since it was written several traditional, ideological paradigms back! But what the ancients did not know then should not, I believe, be used as an excuse to remain ignorant now. That said, I find great resonances in the Bible, most especially in its tensions. I agree with those who see the Jesus in the Gospel of Mark as an apocalyptic wanderer, whose declarations about the coming Kingdom of God were politically subversive and landed him on the cross when he transgressed the Roman imperial political order. And I hold with those who have noticed a softening of this rhetoric as we progress through the later synoptic Gospels and especially into John, as the writers seek a more accommodationist posture to smooth over the original anti-Roman sentiment, and therefore theologize the message of Jesus to make it more about heaven and hell than the world right now. I also hold with those who see in the undisputed letters of Paul a far more radical visionary than the reactionary later letters written in his name, which reinforce imperial domestic hierarchy by telling women and slaves to be subject to their masters, and warn Christians to be obedient to the governing authorities. So much of what we see as prohibition can actually offer solace to the condemned, for leaders rarely condemn behaviors that aren’t already going on. Women probably were subverting their traditional roles (we have evidence of this in apocryphal writings) based on their readings of the Gospels and Paul, so later writers wrote reactionary treatises against this to accommodate the new religion to the Roman imperial order. I don’t necessarily blame these writers for this accommodation: it was an understandable act of self-preservation when the man at the center of your new sect was crucified as a political subversive. And yet I also see, in the early movement’s refusal to let its highly charged political message die with Jesus’ political assassination, a tenacity that echoes across time, from Mohandas Gandhi to Martin Luther King Jr. to Oscar Romero, all of whose opposition to oppression most definitely resurrected (i.e., stood back up) after their assassinations and continued to effect change through their followers. In sum, I think it’s less important how I read the Bible than it is how each and every person approaches it himself or herself. This is why I stridently oppose those denominations who assert the opposite: that there is a “clear and straightforward” meaning that we all must assent to in order to be good Christians. As anyone knows who has read the problem passages of the Bible in their original languages, “clear and straightforward” are the least honest appraisals of them. To maintain such a position requires elaborate, pseudo-intellectual apologies as well as cultural shunning and intimidation. Little wonder, then, that these two things so often go hand in hand. And to the skeptic who thinks the Bible is nothing but myth and should be shelved in favor of science textbooks alone, I offer only this: So the Bible is largely myth, let’s say. So what? So are those works we still have our students read in any good core curriculum. They don’t read the Iliad to get an historical account of the Trojan War: they read it to get a human take on the brutality of war and cyclical violence, and on the problematic nature of working out divine reason (or any reason) within such a sinking hole of chaos and despair. Likewise, I could no doubt get a more clinical and factual understanding of the human birthing process from a medical textbook, but I think I would be more moved by a fictional account describing its joys and wonders. When the material of the Bible is deemed dubious by modern science and history, the Bible should then be approached as literary aesthetic: as a colorful backdrop in which to wrestle with life’s issues, in much the same way we use music, theater, and other literature, a great portion of which, in the West, has been influenced by the Bible in the first place. Indeed, the Bible permeates our culture in ways many people are not even aware: concepts and terminology that originate on its pages are bandied about even in the conversations of those who see no place for it anymore. It's this cultural centrality that makes it not just any book, but really The Book for understanding much of western culture and history, warts and all. So that’s my take. It will not make the conservative happy, who sees the Bible as the Source For All Truth, which should then be applied uncompromisingly to today’s issues, facts to the contrary be damned. But that approach is intellectually bankrupt, and an insistence on reading the Bible that way will only further relegate it in the eyes of increasing numbers of people to the trash heaps of yesteryear. If people want the Bible to have meaning and remain relevant, they should be willing to free it from the fetters of certainty and authority. When viewed with neither apology nor polemic, the Bible can be enjoyed as the richly fascinating set of texts that it truly is. * I present this in no way authoritative, and nothing I say should be considered representative of my church or denomination. These are my views alone, yet few if any of them are likely original. I draw from a number of sources here, and can provide citations to particulars if anyone is interested. Don, this is interesting. I've lost count of the number of times i've cracked open a study Bible and had to grown at the great pains the authors (editors?) took in their copious footnotes to "prove" that the Bible was the completely internally consistent and inerrant Word of God(TM). Have you ever encountered one that does the opposite? That is, points out and embraces the vague and sometimes contradictory bits? Absolutely. Both the HarperCollins Study Bible and the Oxford Study Bible are both good, academic Bibles, with entries from mainstream scholars who point out the differing interpretations of the books as a whole, and with extensive notation on cross-references, etc. Also, the Scholars Edition of The Complete Gospels does this as well for the Gospels, by Polebridge Press (the Jesus Seminar). Otherwise, there are a number of academic commentaries on the Bible book by book, but they would be cost prohibitive for most people. However, most university libraries should have them (like the Anchor Bible -- not always perfect, but exhaustive nonetheless).